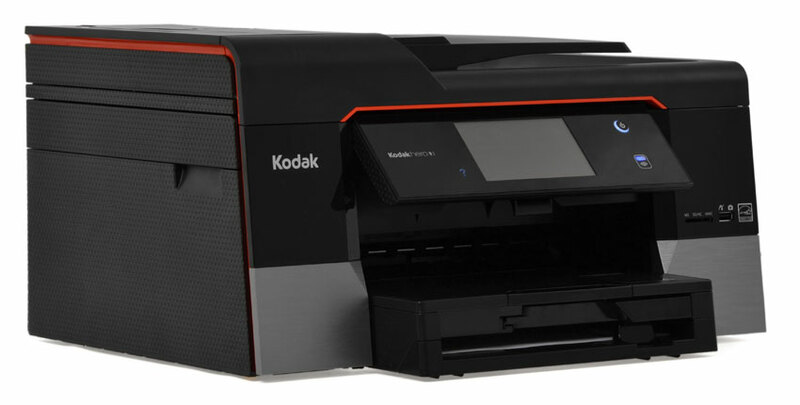 The Kodak Hero 9.1 is a good, solid printer, but falls short on the more advanced functionality it aspires to provide. 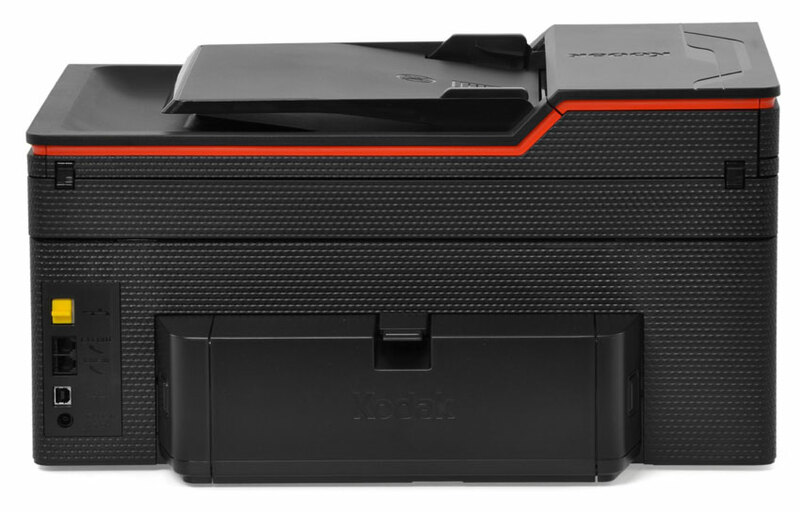 The Kodak Hero 9.1 is the brand’s new flagship desktop printer, topping a range of less-equipped, less-expensive models including the Hero 3.1, 5.1, 6.1, and 7.1. The Hero 9.1 comes complete with trendy features like 3D printing (the paper glasses kind), a 4.3-inch touchscreen, 30-page automatic document feeder, and the usual multi-function features including scanning, copying, printing, and fax. The entire Hero line offers access to mobile printing options including Google Cloud Print, Kodak Email print, and Kodak’s Pic Flick iPhone app. Despite having all the bells and whistles of a fully connected, multi-function printer, the Hero 9.1 doesn’t quite measure up because of some user-unfriendly glitches, loud processing, and connection issues. Kodak has staked its reputation on the affordability of its printer ink and ease of use, so it isn’t terrible surprising that the design isn’t the manufacturer’s first priority. The Hero 9.1 is far and away more stylish than many Kodak printers, but it’s still a bit clunkier and more awkward than competitors from Canon and HP. The Hero 9.1 sports an ever-present touchscreen that doesn’t fold into the printer, instead angling out over your input and output trays at all times. That said, the only instance we could imagine this being inconvenient is if you were trying to access the touchscreen while you were printing a text document. We found ourselves wanting to push all the pieces of the printer into itself to reduce its footprint when not in use, but only slide-out pieces on the paper trays can collapse. The paper input tray, the output tray, and touchscreen all jut out from the front panel of the Hero 9.1, accounting for an approximate two inches of space beyond the actual base of the printer. That’s not a lot of space, but it can make a difference if you’re working with a confined area. The printer has a magnesium alloy-like base, which gives it a sleek, sturdy appearance. From there, Kodak builds upward with a very shiny black, fairly fingerprint-resistant material (also used around the touchscreen). 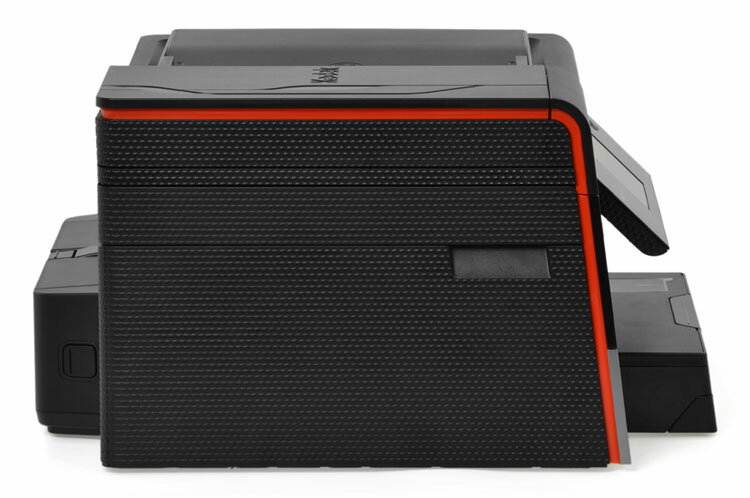 The feed and output area for scanning and faxing is a matte black plastic that has a much cheaper feel and look to it. The Hero 9.1 is a fairly large device, but that makes sense considering its position at the top of Kodak’s Hero lineup. There are smaller, more modular options if that’s what you’re looking for. Though it’s bulkier than the compact little Hero 3.1, you get a larger touchscreen, a separate photo tray, automatic two-side printing, faster printing, and an automatic document feeder, all of which make it better suited for a home office scenario. The touch panel is simple, and there’s only one button on the entire thing. The front panel has SD and USB ports, so there’s no need to search or reach around to find these inputs. 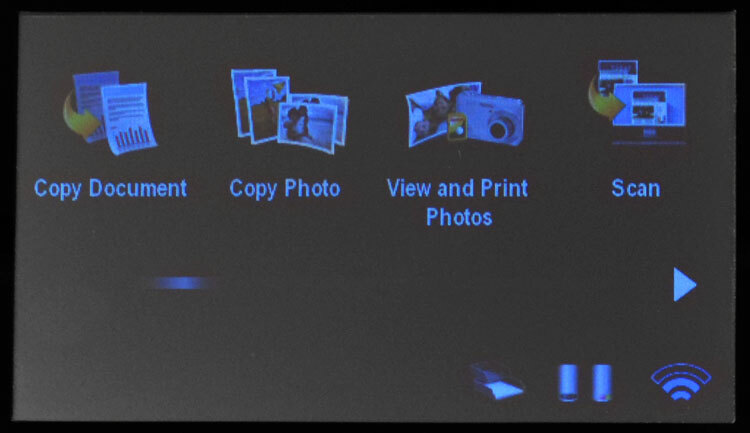 When you’re printing photos, there are built-in options for cropping and rotating your images. Setting up the Kodak 9.1 Hero was no more difficult that with most printers, although at 18.7 pounds it’s a tad bit heavier than many we’re used to dealing with. Things didn’t feel like they quite snapped into place as easily as most printers, but everything came together relatively quickly — always a plus. After you’ve dealt with its outsides, you’ll have to defer to the touchscreen to get the system set up. Start up takes a minute after you press the power button, where you’ll be taken to a home screen of sorts. There isn’t really a dedicated home screen; instead, you just scroll through all of the printer’s functions. But once you select one, a home button icon will light up to the left of the display to take you back. Using the touchscreen emits a rather annoying sound, so we recommend going through to printer settings and turning them off. The “soft” setting doesn’t quite cut it (it’s still terribly jarring), but we wish there were an in-between because some sound notification is encouraging, especially during setup. After getting this taken care of, head over to network settings so you can connect the printer via Wi-Fi. We’ve said it once and we’ll say it again: If you find yourself needing a printer, we highly suggest springing for a Wi-Fi capable device. The convenience makes all the difference in the world. Wi-Fi setup was simple, and we had no connectivity issues the first time we connected. But then trying to get our laptop to recognize the computer turned into a different story. So we tried to reconnect. Several times before it worked. One aspect that some users might find to be a major flaw (perhaps especially if you’re working in a close quarters) is that the machine is generally very noise. Start up, controls, printing: You can seriously hear the gears turning inside. Navigating the touchscreen’s UI, like all devices, took some getting used to. The scroll setup is easy to paw through, and we found that while the capacitive touch buttons were adequately responsive, the screen was not. We found ourselves pressing harder and more repetitively on the screen than we wanted to. Kodak has more than a few bragging points for the Hero 9.1: a 4.3-inch touchscreen, all-in-one capability, Google Cloud Print, Kodak Email Print, and its smartphone app, Kodak Pic Flick. The problem is that many of these don’t work as easily as they should. Setting up Cloud Print took longer than it should have, the smartphone app didn’t recognize the printer multiple times, and we generally had to spend more time than many consumers have or want to when it came to using the printer via Wi-Fi. That’s incredibly frustrating when you pay more for a machine with the expectation it will provide convenience. All those glitchy frustrations aside, printing via Ethernet as well as using the USB and SD card ports worked seamlessly. Scanning and saving to these devices also worked well and was headache free. The touchscreen is becoming surprisingly more common in consumer-level printers, and while touch could be a bit finicky with the Hero 9.1, the panel’s icon controls were clear and worked well, and the display was bright and easy to read. The Pic Flick app told us our photos were forever pending when we tried to send them to the printer. We were tempted to give the Hero 9.1 the benefit of the doubt and blame network issues, but we’ve used the app on the same network with other Kodak printers before and never experienced this issue. Other notable features include 3D printing (a novelty to say the least), 30-page document feed for scanning, copying, and (this is funny) faxing, an automatic 40-sheet photo tray, a 100-sheet paper tray, and automatic two-sided printing. There are auto-templates for printing your own graph paper, sheet music, or shopping lists with the included software, as well as basic photo editing and sorting. The Hero 9.1 may have had connectivity problems and glitchy set up, but its printing performance was on par with competitors. It’s not the fastest printer on the market, but we often find that if it’s below a certain time limit (a basic black and white text page should print well under a minute) then your needs are likely being met. The Hero 9.1 passes this benchmark easily. When you’ll wait is during startup however: The printer takes a long time to warm up and you’ll find yourself starting on the powering up screen waiting to finally use the thing. However, when in use the Hero 9.1 is extremely noisy. Start up is loud, printing is loud, everything it does is loud. Just be forewarned that if you’re in close quarters to your printer, you’re going to get an earful. The clarity in our photos and text were spot on, though, with dark blacks and bright colors. Our scans were also clear of smudges and easy to read, and overall the Hero 9.1 met all of our printing expectations. Like we said, though, when using the printer via Wi-Fi, it wasn’t terrible fast. Printing one page of directions in color took about 50 seconds. A high-res photo clocked in at about four minutes in one of our tests. Inserting an SD card and printing was much quicker, but strangely, there were a couple of instances in which the display didn’t tell us what the printer was doing. When printing documents, it always read “printing,” but that wasn’t always the case when trying to get photos, and when you’re dealing with glitches, not knowing what your printer is up to can be frustrating. One of Kodak’s biggest selling points is its high ink quality and low costs, both of which have always proven themselves to be true. If cost and efficiency are your main concerns, than these factors might outweigh the system inconveniences we experienced. While it met our printing expectations, a printer in this price range needs to do a lot more than lay ink to paper. 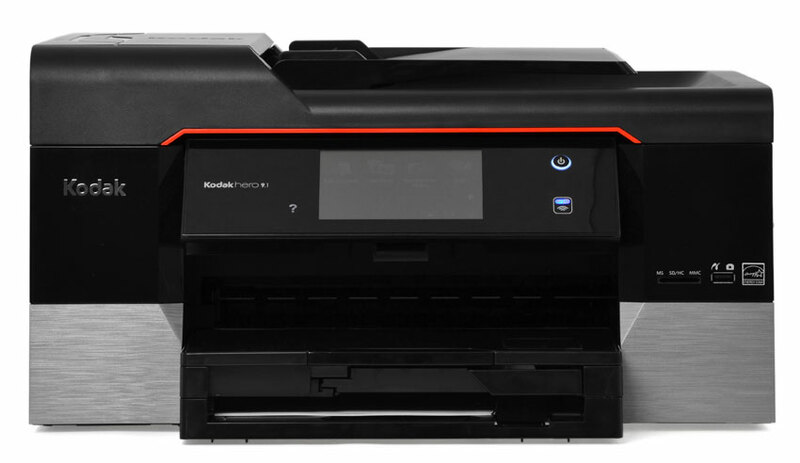 A premium multi-function printer like the Hero 9.1 aspires to more. Wireless connectivity, built-in photo editing, and perks like a smartphone app that cut out the need for a PC altogether. When those things don’t work, or lag, or consistently cause you to look for workarounds, they aren’t worth it—especially when they are coming from a $250 device. The Hero 9.1 is a good, solid printer, but falls short on the more advanced functionality it aspires to provide. It comes with a slew of extra features that you pay extra for, but they don’t work seamlessly, and they required more effort on our part than competing printers have. Adequate printing can’t really erase those faults.